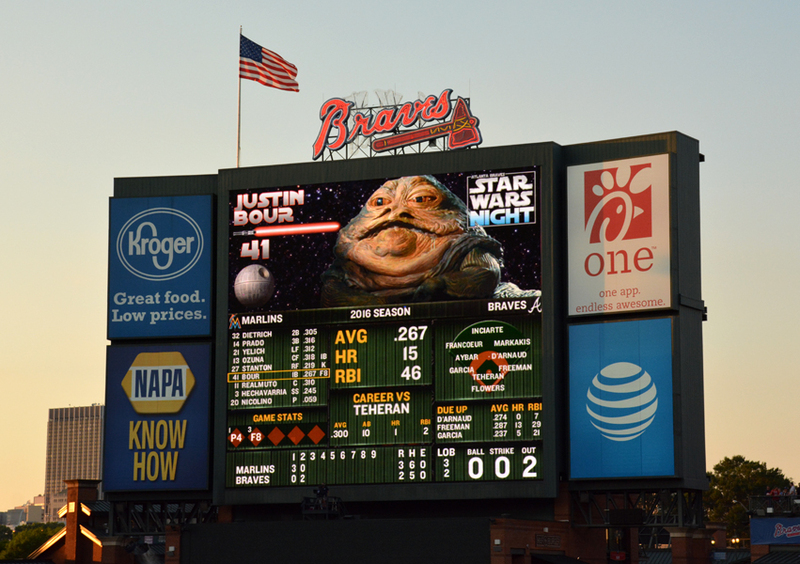 I finally made it to Star Wars Night at Turner Filed, an extra-fun Atlanta Braves game. 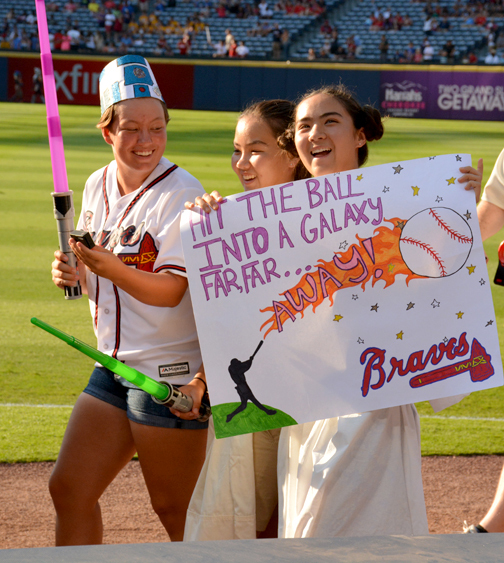 The fun was out of this world, "in a galaxy far, far away"...yet really close! And the fun began as soon as you stepped inside the gate. 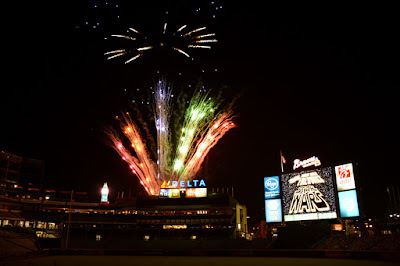 As most everyone knows, this is the final season the Atlanta Braves will play in Turner Field. We're not sure "exactly" what's going to happen to the field, but I sincerely hope it finds a new home, avoiding the wrecking ball. I hope the Braves like their new home, but I'm going to miss having them so close to downtown! 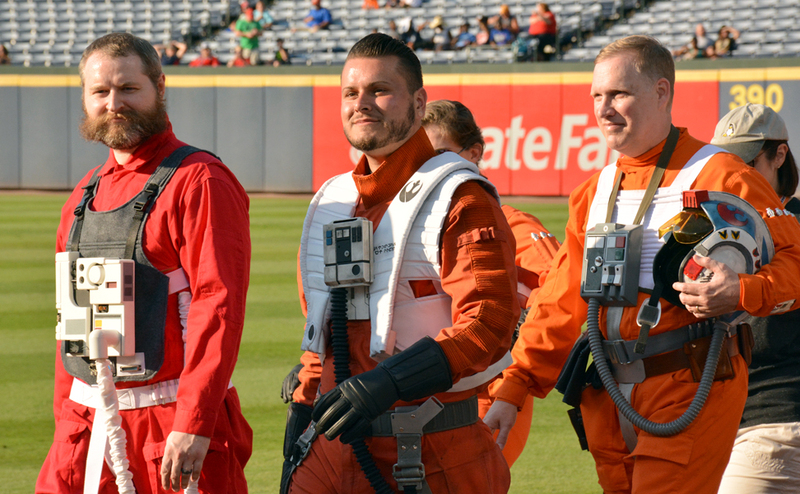 I made sure to make it to the field in time to see the on-field Star Wars Parade, which started 45 minutes before game time. Some of the parade participants were fascinated with the view from the field. The youngster pictured above looks so very much like my great nephew Johnny, also a curious little fellow. The field was fully wrapped by time all the participants made it out. There were some excellent costumes and it looked like everyone on the field, including staff and players, were having a great time! 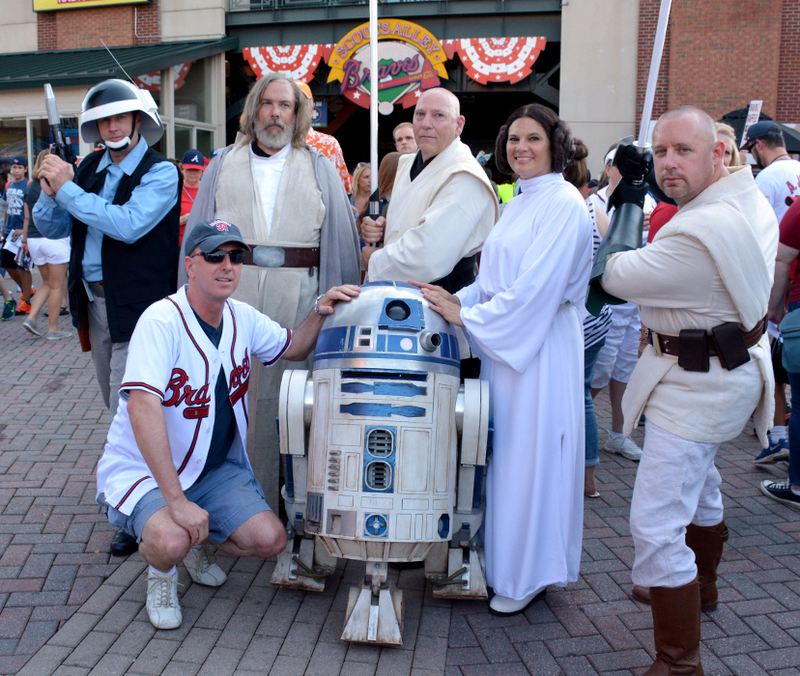 If you're making plans to attend a Braves game that has a parade, do make time to see it...it's great fun! Check the schedule for games that have a parade. Of all the Star Wars characters, Yoda is my all-time favorite. And he's the one I most often quote, for inspiration: "The is no try. Do or do not." I love the droids, too, but Yoda is wise and tell it how it is. I admire that directness. 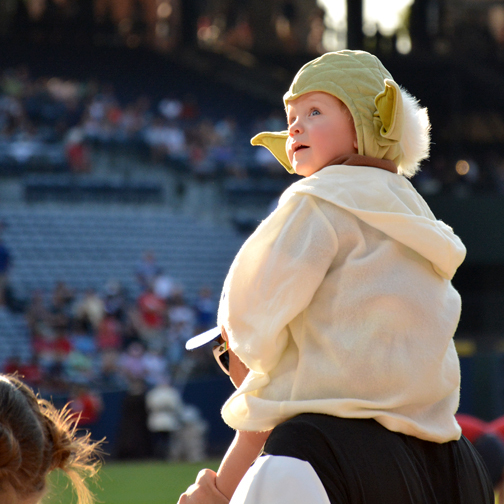 As I mentioned, there were some awesome costumes for Star Wars Night! There were characters and cosplayers throughout the stadium and up by the giant drum near the main entrance, but the parade is when you get to see the costumes best. 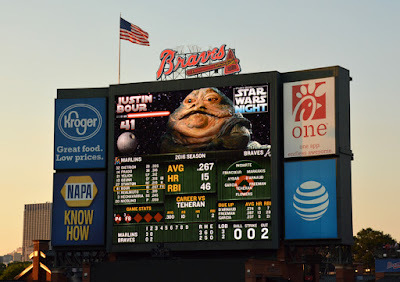 When I went to "Zombie Night" at Turner Field last year, they had zombiefied everyone on the scoreboard. 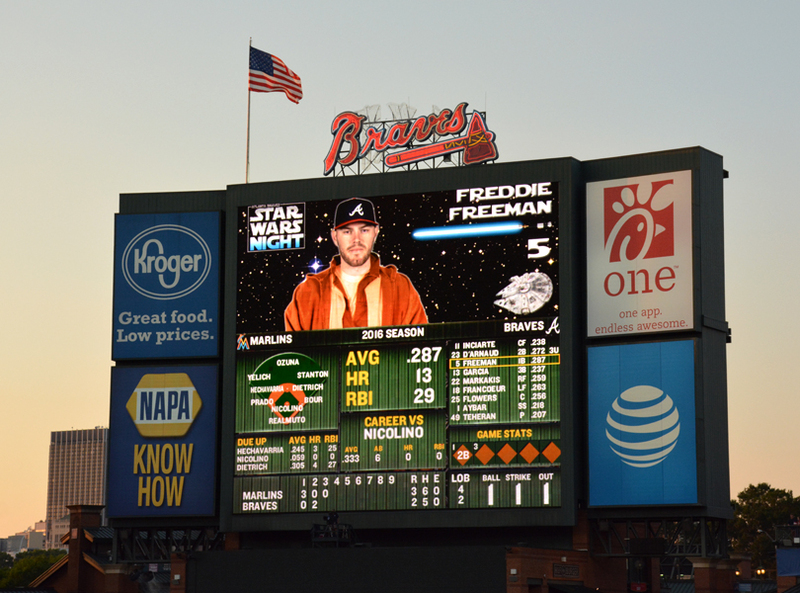 For Star Wars Night, they used bad guys (Yoda, Boba Fett or Darth Vader) for the opposing team's photos. But there was video of them getting ready to bat, so it was all in fun. 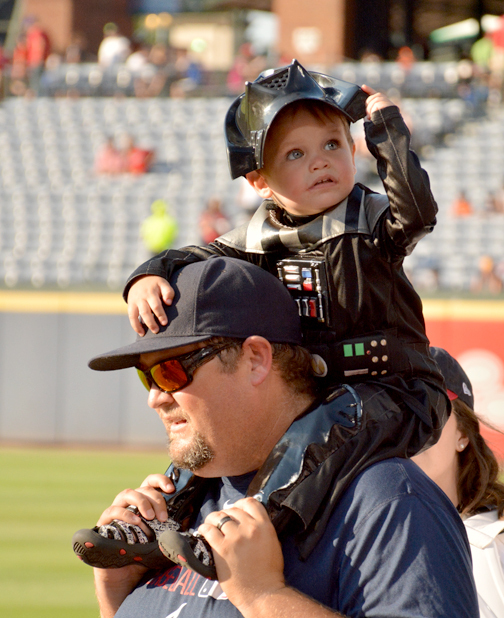 For the Atlanta Braves, they dressed them in good guys costumes! 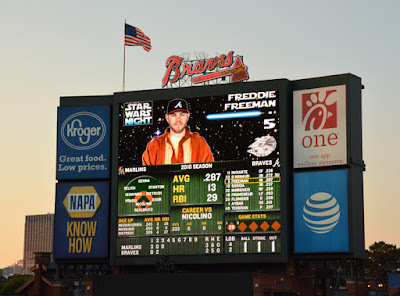 They played a great game, but a few Jedi mind tricks for the win would have been nice. The next Zombie Night at Turner Field is scheduled for Friday, July 15. I had a great time at last year's, as I did at this year's Star Wars Night. I highly recommend going! Just remember to get there at least an hour early so that you have time for photo ops and to see the on-field parade! 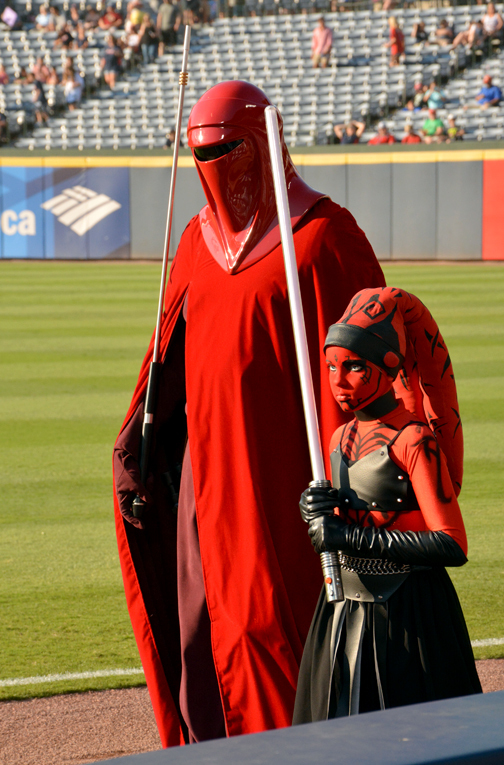 I've been talking about Star Wars and not much about baseball, of which I am truly a fan. There was some excellent playing this game. In fact, we went into overtime with a 5-5 score. At the bottom of the 10th, with bases loaded, we thought we'd win the game. 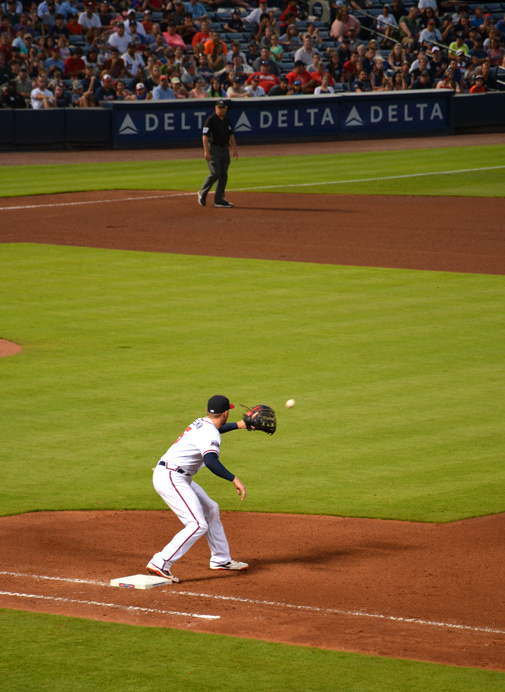 But that wasn't the Braves' destiny...not that night anyway. The game finished 5-7 at the bottom of of the 12th inning...it was a long game, but a good game! And as is tradition for Friday night home games, there were fireworks! On this particular evening, however, the fireworks were choreographed to Star Wars music. 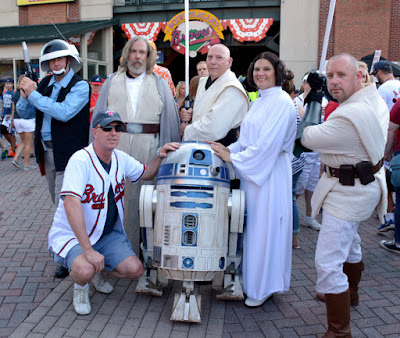 The evening was great fun...I'm so glad I finally went to a Star Wars Night at Turner Field and I wish the Atlanta Braves all the best next year at their new home.